Narrating the Crisis: Hegemony and the South African Press is the first book to offer a historical overview of the press in relation to political economy. The book offers a conceptual framework for media analysis, followed by case studies dealing with the long running battle between Nasionale Pers and Perskor, the press and educational reform, labour reporting and the role of the press on issues of black housing. Published under the above tote by Anthropos Press, Bellville, South Africa. British edition published by James Currey (London) under the title, The Press in South Africa. US edition published in hard copy by Lake View Press, Chicago, under the same title, the Press in South Africa. This book traces some of the key research conducted over a ten-year period by graduate students of the Centre for Communication, Media and Society (CCMS) Entertainment Education/ Communication for Participatory Development course from its inception in 2002, untill 2011. Innovative methodologies and indigenised theories are brought to bear through these honours, masters and PhD research projects, which reflect the Freireian derived experientialist pedagogy of CCMS, where students take responsibility for developing their own research directions within specific research programmes. There is a strong emphasis in this collected work on media, social justice, health education and human rights issues, especially relating to historically disadvantaged communities. The book is a collection of outstanding work from CCMS students, and is a useful resource for scholars interested in contemporary health, communication and development research. ALL RIGHTS RESERVED. This book contains material protected under International and Federal Copyright Laws. Any unauthorized reprint or use of this material is prohibited. No part of this book may be reproduced or transmitted in any form or by any means, electronic or mechanical, including photocopying, recording, or by any information storage and retrieval system without express written permission from the author / publisher. Van Zyl, John, and Tomaselli, Keyan G (1977). Media and Change. Johannesburg: McGraw Hill. Cultural Studies has evolved and continues to evolve primarily along regional lines. however uncomfortable this might be, the genie of British cultural studies cannot be returned to the bottle of history. Thus, national versions of cultural studies have arisen in a few African countries. This book engages two critical and seemingly contradictory tasks: i) to contribute to the development of cultural studies from the perspectives of African experiences and indigenous frames of reference; and ii) to examine these in terms of transnational trajectories of the field in ways that do not reduce them to one or other context. Much cultural studies remains concerned with Texts, often disconnected from their contexts. for the authors published here, The contexts include African philosophies, cosmologies and ontologies. It includes the writings of both residential natives and those who have re-located to the diaspora, a spread that opens conversations with international approaches that include and exclude African experiences and work. This anthology juxtaposes many different kinds of cultural studies done in different parts of the world as a means of creating a global dialogue around the signifier of 'Africa'. This book was first published as a special issue of Cultural Studies. Keyan Tomaselli is Senior Professor and Director of The Centre for Communication, Media and Society, University of KwaZulu -Natal, Durban, South Africa. He is editor of Critical Arts: South- North Cultural and Media Studies and co-editor of the Journal of African Cinemas. Handel Kashope Wright is Professor, Canada Research Chair in Comparative Cultural Studies and Director of the Centre for Culture, Identity and Education at the University of British Columbia. Clelland-Stokes' forceful analysis of visual representations of aboriginality will be of interest to scholars and students in the field of visual anthropology, culture and media studies, film studies, and anyone interested in the visual culture of aboriginal and indigenous communities. Broadcasting in South Africa examines the history of the broadcast media, both radio and television, in enhancing and creating the "general affairs" and "own affairs" cultures required by the National Party for their continued dominance. The book examines struggles within the South African Broadcasting Corporation, the reasons for and content of TV2/3, the role of soap operas in ideological legitimation and the way in which broadcasting technology has been shaped for political ends. Keyan Tomaselli is director of the Contemporary Cultural Studies Unit at the University of Natal, the editor of Critical Arts, and author of The Cinema of Apartheid: Race and Class in South African Film. Ruth Tomaselli, who has served on the board of the South African Broadcasting Corp., is a lecturer in the Contemporary Cultural Studies Unit at the University of Natal. Johan Muller is senior lecturer in Education at the University of Witwatersrand. L’étrange cinéma sud-africain à l’époque de l’apartheid. The Pro- and Anti- Conscription Press in South Africa. Qualitative methods are material and interpretive practices. They do not stand outside politics and cultural criticism. This spirit of critically imagining and pursuing a more democratic society has been a guiding feature of qualitative inquiry from the very beginning. The Crossroads in Qualitative Inquiry series will take up such methodological and moral issues as the local and the global, text and context, voice, writing for the other, and the presence of the author in the text. The Crossroads series understands that the discourses of a critical, moral methodology are basic to any effort to re-engage the promise of the social sciences for democracy in the 21st Century. This international series creates a space for the exploration of new representational forms and new critical, cultural studies. A book descr ibing the history of South African cinemas can never be about cinemas only, for the subject will always be intimately intertwined with its context, in this case 20th century South Africa. Keyan Tomaselli, one of the founders of cultural studies in SA, explores in this book how South African cinemas and films have been decidedly shaped by the country?s history. In turn, films have inspired their makers and audiences to understand, and come to terms with, the complex phenomenon of modernity. Discussing film theory, narratives, audiences and key South African films and filmmakers, Tomaselli aptly demonstrates that the time has come to adapt a more ?African? view on African cinemas, since western theories and models cannot automatically be applied to an African context. Prof. Keyan Tomaselli (Culture, Communication and Media Studies Department, University of KwaZulu-Natal) previously worked in the film industry and was co-writer of the White Paper on Film. His seminal books include The Cinema of Apartheid and Appropriating Images (1996). His interests are political economy, African cinema and visual anthropology. Having fun while Rome burns: Is there a text in this context? What definition of African film? APPROPRIATING IMAGES is a notable achievement for two main reasons. 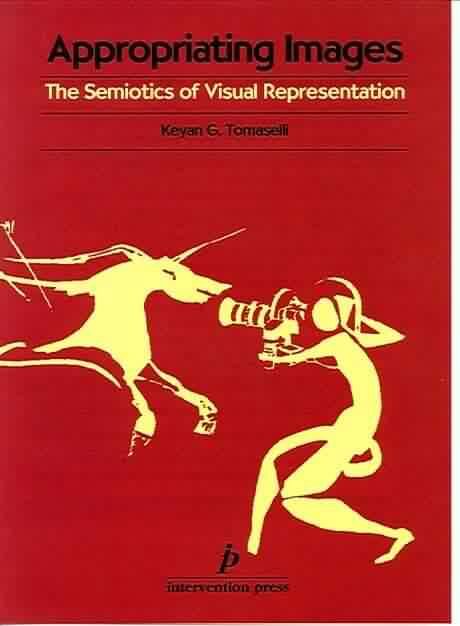 Firstly, by using a single interpretive paradigm - derived from semiotics - to discuss a wide variety of documentary films - Keyan Tomaselli has been able to give an integrated and coherent account of some of the issues which have most bedeviled the discussion of film by visual anthropologists, such as the relationship between the written and filmed ethnography, objectivity and reflectivity and the unequal power relation between film makers and subjects. The Visual Story - a world apart? The 'Us' 'Them' Dichotomy: Where to We draw the line around Them? How to ensure Accountability of Crews/Facilitators of Subject-Communities? "Tomaselli's bold, well researched expose of the history of an art form struggling in chains under apartheid [is] a fascinating and invaluable book for anyone interested in film, anywhere." (Nadine Gordimer). How a nation looks at itself and shows itself to others is often revealed in its movies. But alongside this more flattering self-image, its movies may also reveal realities which it would rather conceal. This ambiguity is particularly true of South African films, which reflect the daily life and values of a society governed by extreme theories of racial separation. In The Cinema of Apartheid, Keyan Tomaselli analyzes the historical development and present state of South African cinema. Assuming no special knowledge on the part of the reader, the author provides fascinating descriptions of the movies, with penetrating comments on how they reflect South African realities. Tomaselli addresses all aspects of the film industry. While focusing on domestic productions, Tomaselli also discusses the many international filmmakers who use South Africa as a location. He begins with an account of how the government uses subsidies and censorship to determine which films are made. He explores the tensions between English-language and Afrikaans-language films, and between films made for whites and films made for blacks. Considerable attention is given to the media and the distribution system which shape the nature of film discourse in South Africa. Tomaselli takes his readers behind the scenes to examine the industry in is financial infrastructure, its marketing strategies and its work habits. He concludes with an appraisal of the independent cinema created on the margins of society and the obstacles facing South Africans who wish to create films with artistic and political integrity. He shows how social polarization has produced a great gap between what is and what might be, but holds out some hope for progress. The documentary section of The Cinema of Apartheid is the most comprehensive research on South African film ever to appear in print. A filmography lists all feature films made in South Africa between 1910 and 1985, together with numerous documentaries about South Africa, including films by exiles and non-South Africans. The bibliography cites outstanding writing from three continents. Tomaselli's approach, combining historical, political and aesthetic analysis, offers a unique view of a country in turmoil. The Cinema of Apartheid may prove to be not only the definitive book on South African cinema, but also a model study of an entertainment industry. Intervention Press, Castenschioldsvej 7, Højbjerg, Denmark. Fax: (+ 45) 86 275-133. Tel: (+ 45) 86 272-333. Orders supplied by Intervention will be levied DKK30.00 / 3 pounds sterling / ECU 4.00 to cover postage and packaging. If more than three titles are prdered P and P will be free. Residents of EEC should add 25% VAT unless VAT registered in their country of residence. Lake View Press, P O Box 578299, Chicago, IL 60057, USA. Examines films, videos and TV series made by local and overseas producers. This book examines films, videos and TV series made by South African and foreign producers. Amongst the titles discussed are Laurens van der Post's TESTAMENT TO THE BUSHMEN, various films made by John Marshall and others on the !Kung, the SA Broadcasting Corporation's THEY CAME FROM THE EAST and the British-made WHITE TRIBE OF AFRICA. The authors have dawn from their extensive film production experience to develop a set of principles of ethnographic production. The authors discuss the very thin line between propaganda and documentary, and show how ethnographic films become propaganda in particular viewing contexts. Apartheid propaganda films examined include TO ACT A LIE, A PLACE CALLED SOWETO and WHITE ROOTS IN AFRICA. Århus: Intervention Press in association with the Gaduate Programme in Culturaland Media Studies, University of Natal. This case study describes a process undertaken by a group of researchers and video-makers working with herders in the remote regions of North-easten Lesotho. it examines the debates raised by visual anthropology and ethnographic filmmaking and the method and practice of 'community video' theory. The book gives a first-hand account of - and reflection on - the fieldwork undertaken. It explores the relations between researchers and the subject community, the production practices and the development of a finished project. Public Service Broadcasting: Policy Directions Towards 2000. A consultative report on a two year project commissioned by the Film and Allied Workers Organisation, and the Film and TV Federation. The new technologies component was funded by the SA Broadcasting Corporation. Women Broadcasters and Affirmative Action at the SA Broadcasting Corp. The first book to offer an historical overview of the press in relation to political economy. The book offers a conceptual framework for media analysis, followed by case studies dealing with the long running battle between Nasionale Pers and Perskor, the press and educational reform, labour reporting and the role of the press on issues of black housing. Narrating the Crisis: Hegemony and the South African Press is the first of a series of three books, compositely entitled Addressing the Nation. The aim is to examine the history of the commercial press, broadcasting and the 'alternative' press in South Africa. The present study, edited by and written largely by Keyan Tomaselli, Ruth Tomaselli and Johan Muller, concentrates on the mainstream commercial press, and contains a general theoretical overview of the methodology to be adopted, a chapter which traces the political and economic context of the South African media, and several 'case studies' which investigate the struggle for political dominance between the two Afrikaans publishing groups Perskor and Nasionale Pers, the reporting of educational matters by the Afrikaans press, and the responses in English-language newspapers to labour issues and to the 'problem' of black housing. With buzz-words like ideology and hegemony immediately confronting the reader, the approach and conclusion might seem predictable: the mainstream press in South Africa, whether English or Afrikaans, was ultimately the lackey of racial capitalism, its selection of news dictated by what was not harmful to the prevailing system of power and privilege. In consequence the 'freedom of the press' is a myth, as anyone possessing the superior insights of Althusserian Marxism knows, and instead we have news as an ideological discourse mediated by journalists who, as members of the petty bourgeoisie, consciously or unconsciously participate in hegemonic processes. That this is the consensus of the various contributors does not, however, make Narrating the Crisis itself simply an overdetermined product of the plot of history. In their opening section the editors suggest a theoretical grid which will take into account not only Althusser's somewhat idealised view of the functioning of state apparatuses (whether political parties or newspapers), but also Raymond Williams's notion of 'experience' as a mediating activity through which social process is 'lived' by different people, and E.P. Thompson's concept of values (activities which vary according to class and therefore compete in any socio-economic arena). We are reminded that ideology and culture are the products of human endeavor and not just passive reproductions of the state and its institutional life, and the essays in the book succeed on the whole in conveying the complex character of press interests and practices in our social formation. If hegemony, as Gramsci puts it, is the unstable equilibrium that a ruling class achieves at a particular moment, the authors do not try here to erase or avoid the often conflicting demands of race, capital, Afrikaner sectionalism, Botha's "Total Strategy" and journalistic liberal tradition which together constitute something of the operating field of the commercial press in this country. Chapter 1, 'A Conceptual Framework...', clarifies difficult theoretical issues, while Chapter 2 explores the parameters of 'freedom' and 'constraint' in the construction of news. In relating reportage to larger contexts the mainstream press, we are told, highlights 'events' at the expense of situational analyses, so that as 'resettlements' of black communities became more frequent, for example, we have a 'condition' which is no longer newsworthy. Such procedures of selectivity, emphasis and 'gatekeeping' have of course a powerful effect on the shaping of the South African 'reality'. Johan Muller writes with subtle understanding of the Afrikaans press, but I tended to get a little lost in Simon Burton's chapter on 'Labour and the English-language Press'. The problem (that the commercial press reports on dramatic disputes while largely ignoring the ongoing processes of labour development and contestation) should be fairly self-evident given the nature of the commercial press and its readership, and the argument could have been shortened to effect. Perhaps a perspective of debate on Burton's chapter can only be supplied by a comparative study of mainstream and 'alternative' approaches. How do New Nation and The Star respond, respectively, to similar labour-related concerns? Is the Weekly Mail, which has a largely white 'bourgeois-intellectual' readership, a labour-event or a labour-process newspaper? As my own field is South African literature, I noted with interest that Jeffrey McCarthy and Michelle Friedman preface their chapter on black housing with lines from Lionel Abrahams's poem Soweto Funeral, and comment that 'social scientists may have been a little less perceptive than the poets in their interpretation of the existential role of the dilapidated built environment assigned to blacks...'. The point is that poets have usually tried to touch the 'lived experience' in all its local contours. McCarthy and Friedman attempt to subject the urban geographer's understanding to the political and commercial prerogatives of the press and address questions such as: Why did the media 'discover' black housing during certain periods? ; against what background was the 'discovery' of black housing made by different sectors of the media and in what context was it discussed once it emerged as an issue? But the argument, while rigorous, seems ill at ease with the contours of our own experiential geographies, and the authors admit in their postscript that their article, which was written some years previously, relied perhaps too exclusively upon European Marxist concepts to interrogate specifically South African urban problems. The reminder is a useful one. A great deal of current cultural analysis uses concepts such as ideology and hegemony in overly Europeanised ways. Generally, however, Narrating the Crisis avoids the diagrams of any new Eurocentricism and firmly rubs theory against local circumstances. For this alone, the book should prove valuable not only to students of cultural studies, but to a wider readership concerned to understand the signifying procedures of this society. Finally, I would suggest that free copies be sent to the editors of our mainstream press. Perhaps they would then begin to realise, more self consciously, why their state of emergency their editorials, based on good liberal principles, sounded so hollow in a vacuum of sociopolitical investigation. If detentions had become a 'condition' and therefore no longer particularly newsworthy, thank goodness for 'events' such as Fergie's pregnancy or heart throb Barnard's most recent wedding! Examines the history of radio and TV between 1920s and 1984,. Chapters cover ideology and technology, apartheid programming, SABC editorial policy, 'black' TV and radio, and South African radio and TV soap operas. The Alternative Press in South Africa focuses on the history of "black" newspapers from the missionary press, linking the struggles of this press and its editors to contemporary publishing ventures by oppressed communities, trade unions and the student presses. It also offers an historical overview of the black Media Workers Association and its role in questioning conventional newsgathering and reporting. P. Eric Louw is also a lecturer in the Centre. The future of the media in post-apartheid South Africa is debated by leading scholars and activists, including people who played key roles in formulating media policy during the 1990s, ranging from members of the Communist Party to Broederbunders. Featuring original and hard-to-obtain documents. Eric Louw is a senior lecturer in the Centre for Cultural and Media Studies, University of Natal, Durban. He has been centrally involved in South Africa's media policy debate. Many of his papers (reproduced in this book) have influenced the ANC's media policy. He has published widely on the South African media. RETHINKING CULTURE is an excellent example of how British Contemporary Cultural Studies travelled to South Africa, was reconstituted in terms that different context, and applied in popular struggles against apartheid. The book will be of interest to anyone searching for more information about the situation in South Africa during the 1980s, especially with regard to cultural issues rarely addressed by the media in Europe. Richard Johnson, previously of the Birmingham Centre for Contemporary Cultural Studies, has commented that the chapter, Lineage of Contemporary Cultural Studies, is one of the most lucid commentaries available on the work of his Centre. David Rowe of Newcastle College, Australia, comments that the book "contains a wealth of ideas and information from cultural analysis and political conditions ... These include labour and culture, education and culture, the framing of news in the mass media. Each topic reveals clear parallels with the operation of the mass media in other capitalist countries, also highlighting features unique to South Africa" (AFRICAN BOOK PUBLISHING RECORD). David Kerr, University of Botswana, states: "By turning their backs on an elitist, reified view of culture as the accumulation of values and art objects, by broadening the scope of discussion to include the popular as well as elitist cultures, by emphasizing the connections between culture, ideology, history, class-formation and the material production of knowledge, the contributors have opened up fertile new opportunities for interdisciplinary analysis" (SOUTHERN AFRICAN REVIEW OF BOOKS). Contributors include: Keyan Tomaselli, Johan Muller, Ian Steadman, Ruth Teer-Tomaselli, David Bascin, Julie Frederikse, Muff Anderson and Ntongela Masilela. USA AND CANADA Lake View Press, P O Box 578299, Chicago, IL 60057, USA. EUROPE Intervention Press, Castenschioldsvej 7, Højbjerg, Denmark. Fax: + 45-86-275-133. Tel: + 45-8627-2333. SOUTH AFRICA Anthropos Publishers, P O Box 4258, Cresta 2118, South Africa. Fax: (+ 27) 11-333-2028. Tel: (+ 27) 11 337-3120 (Ask for Frans Boot). Le Cinema Sud-Africain est-il Tombe Sure la Tete? AVAILABLE FROM CineAction, 106, Bd St Denis, 92400 Courbevoie, France. The price for one copy of the publication is 20 US $, which equals 120 Danish kroner (DKK) (includes postal charges). If you choose to pay in US$ please include 8 US$ for bank charges. please pay by bank transfer (SWIFT) to DABA-DKKK,3344-075484, ZEBRA, Den Danske Bank, Holmens Kanal 2-12, DK-1060 København K, Denmark. Please make sure to write your full name and address on the cheque or the bank transfer you make out to ZEBRA. We will send you your copy of VOICES AND VISIONS as soon as we receive your order and payment.